This presentation on ‘mobility justice’ is a way to talk about different relations around mobility in Umeå. And to highlight the power differentials that come into play in any form of mobility, and the different affordances that different people are able to make use of, or appropriate, in becoming mobile (or not). How can the municipality address justice issues around public transportation? Is a smart city infrastructure fair? What are the socio-cultural norms that affect transport use? What are the common perceptions of public vs. private transport? Who’s responsibility is it to care and maintain transport infrastructure? What about equal access? These are some of the questions that will be taken up during the event. This presentation is brought to you by interaction design students of Umeå Institute of Design as part of a 5-week course on ethnography and co-creation. The event will be held in English and is open to the public. And no prior preparation is needed to attend, just your enthusiasm to engage with the topic. Note: The student presentations will remain accessible as an exhibition till the end of the day. In the fall of 2016, I was a visiting student researcher at CESTA (Center for Spatial and Textual Analysis), the digital humanities hub at Stanford University. During two months I had the opportunity to meet great scholars in my field (in this case people engage in digital text methods), observe the inspirational and collaborative research conducted at the Literary Lab, and every day go and work in CESTA’s creative and open space on the top floor in the Wallenberg Hall (when I was not reading in the beautiful Green Library). In my PhD project, I use different methods to study the ideas that shaped why and how the Swedish state communicated with the citizens in the 1960s and 1970s and, in particular, how the changing concept of information in post-war western societies configured the idea and use of governmental information. I use, for example, digital quantitative text methods, were I am especially interested in text mining the corpora of Swedish Governmental Official Reports (Statens offentliga utredningar, SOU, 8000 published since 1922–), as a way to study the “voice” of the Swedish state and the governmental discourse of information and media issues. During my visit at Stanford, I worked on a topic modeling project (with LDA/Mallet) to find co-occurring topics within the SOU corpora, as a way to situate (in my case) the information topic, i.e. the information discourse, in a cluster of interlinked topics and reports. Thus, to better understand the information politics in broader political framework in the context of the report series. Thanks to my supervisor Pelle Snickars, I have the opportunity to collaborate with Roger Mähler at Humlab, who helps me to develop my research from a technical point of view. As a result of my two months work, I presented some findings at a workshop in Vancouver (“How to do things with millions of words?”) and had an open seminar at CESTA in the beginning of November. As a PhD student (in media and communication) with a digital humanities profile, I am also affiliated with Humlab where I am engaged in with different projects concerning digital text methods. Last but no least, I want to thank Humlab for supporting my visit at Stanford! “Tensaii AB is a consulting and user experience design firm. We are an inspiration agency that help our clients to realise and validate their ideas, fast and cost-effective. We are experts in the process of designing meaningful and valuable experiences. Tensaii Experience Cypher™ is inspired by IDEO and Google Ventures – Design Sprints that focuses on speeding up the process of product development to save money and time. Our unique focus for the Tensaii Experience Cypher™ is knowledge transfer, cooperation and that we are all teachers with the each one teach one mindset. Recently the interest in virtual reality has come to life again after having been dormant since the 90’s. Since then much has happened in terms of both hardware and software. A couple of years ago companies and enthusiasts started showing up around the world presenting different solutions that might be able to deliver what the technology was unable to do twenty years ago. In 2016, we have seen the launch of three major VR bets. Oculus, which is backed by Facebook, was the first to launch this new generation of headsets in the form of the Oculus Rift. The game company Valve in cooperation with the HTC is behind the Vive and during the autumn came PlayStation VR from Sony. In addition to these quite expensive and relatively sophisticated systems, there has been a series of cheaper solutions with headsets in plastic or cardboard that you can use to watch VR apps on your smartphone. The development takes place primarily within the computer game and entertainment industry, but interest is also evident from research, education, arts and other areas. At Humlab we are involved in several projects where we test the technology and explore what it could be used for. As part of Humlab’s short course series, we provide introductory courses and workshops where participants will have the opportunity to try out the technology and discuss its capabilities and limitations. The first course was given on November 16 and more chances will come in the spring term. During the fall term 2016 Humlab provides a new PhD course, Digital Humanities II: Applications. The course offers a specialization in theoretical and critical perspectives in digital humanities through seminars and individual digital projects. Stefan Gelfgren, Director of Humlab, opened the course with a discussion on the topic of Digital humanities or humanities in a digital age? The course is a deepening and continuation of the course Digital Humanities I: Introduction which was given during the Spring term 2015. Humlab has received funding from the Wallenberg Foundations for the course in the context of a commitment to research and younger scholars in the digital humanities. Gísli Pálsson, a doctoral student in archeology, will work during the course with the project The farm-as-network: tracing the tendrils of agency across Iceland‘s medieval landscape. The course will conclude with presentations of the individual projects on January 10, 2017. In 2010 Paul Arthur takes up the position of Deputy Director of the National Centre of Biography and Deputy General Editor of the Australian Dictionary of Biography in the History program at the Australian National University. Since 2007 he has been a Curtin Targeted Research Fellow in Information Commons at Curtin University of Technology, Western Australia, and an Adjunct Research Fellow of the Research School of Humanities, Australian National University. During 2009 Paul Arthur is a visiting fellow at two international centres — Center for Cultural Analysis, Rutgers University, USA (teaching his seminar course ‘Writing History with New Media’), and HUMlab, the digital humanities centre at Umeå University, Sweden. Paul will soon introduce himself and his work on this blog. The fall semester will be intense in many ways – many educational programs using the lab, digital media and industry activities, continued installation of the new part of the lab, several conferences, seminars, several research and development projects (youtube, domestic violence, bio mapping, environmental archaeology, internet based population database), disputations (Therese Örnberg Berglund will defend her Ph.D. thesis on October 17, 2009), Umeå 2014 and much more. We are also planning for a new lab on the new Arts Campus (if you are in Umeå and understand Swedish – there is an event at the Design School on September 8). The basic idea behind HUMlab, as articulated early on, is to facilitate the meeting between the humanities, culture and information technology, or put differently, to be a meeting place for the humanities, culture and information technology. The relative vagueness of this description has often been a strength, but nevertheless, over this semester, I will use this space (as well as a couple of articles I am working on), to flesh out my understanding of what HUMlab is and can be. 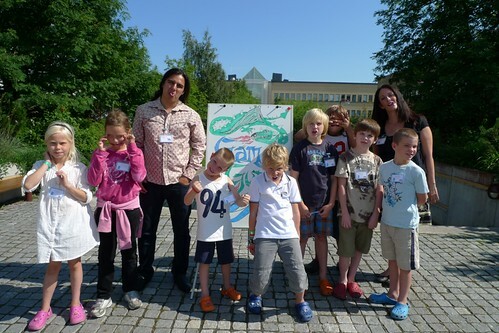 Most important, unsurprisingly, are you – everyone who is part of the lab (whether in Umeå or elsewhere). If you have visited HUMlab recently, you have probably noticed that there are quite a few screens around. Not only individual screens but a number of large’lab screens’. In the extended part of the lab, there is a screenscape currently being implemented with a great number of screens and a basic idea of multiplexity and multiple frame while maintaining a sense of one screenscape. This is quite a large and complex system and I am working on an article right now trying to outline some of the issues at play here. Currently, however, I am thinking of wireless connectivity to screens and projectors. This is something I have been interested on and off for quite some time now. There are projectors with wireless functionality to be purchased and there are a number of (but not too many I think) adapters you can connect to an exisiting projector. There are also software soultions that require a server computer connected to the projector. resolution is limited (naturally), but there is a span here and the low resolution solutions are probably not good enough. many adapter solutions require a USB dongle of some kind to be connected to the laptop (or other computer to display images on the screen/projector) – from this point of view use of a standard wireless network is much better. there is wireless usb technology for this kind of purpose, but again, you will typically need dongles unless you have a laptop with wireless usb built in. most alternatives I have seen are operating system specific and for instance, a Windows computer may remotely download software required to connect to a projector through the wireless network, but this will not work for other operating systems. I would like a solution/device that is not dependent on dongles and that works for Windows, MAC and Linux. Also, resolution must be decent. Any suggestions? Also, since we are implementing a display and audio infrastructure for the new part of the lab, it has occurred to me that maybe the best thing for this part of the lab would be to have a dedicated server whose job it was to manage incoming wireless display (and audio) data from laptops (mainly) and deliver it to screens in the lab through existing distribution systems. Probably there would have to be some kind of control or management system (to allow management of incoming sources). Anyone interested in building this? For other screens in the lab we would probably have to rely on individual adapters or the like so my guess is that we need both. The rationale for all this, of course, is that it should be as easy as possible to connect to screens from (in particular) laptops. Imagine a class setting for instance, a research group or an artist showing their work. With a low threshold there is a likelihood that people would share their stuff more often, which I think is important to the lab. 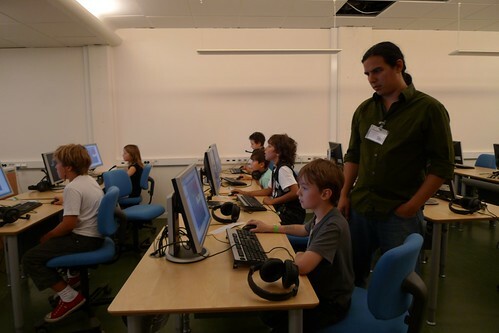 This week Gabriel and I have been co-teaching a course called Learning to learn Scratch. The class is made up of 20 kids from a local 3rd grade. The kids use a puzzle piece method to create small games in two class sessions, and on Monday they will present their work in the new part of the lab on 10 big screens in front of their family, friends and the local media. The kids have worked great together and despite the gorgeous weather, we have had trouble getting them outside to take breaks and play tag in the sun. Gabriel and I have had high hopes for this class. Our pedagogical goal has been to model ways of solving problems that integrate analog, digital, and cognitive skill sets. Gabriel has taught similar courses many times, but this has been my first time so I thought I would take a few minutes to sit down and reflect a bit on the experience. The first day the kids and I went through a three hour tutorial where we made a princess and firefly game. It was both complex and simple and I thought, ‘Wow! How are the kids EVER going to remember this!!’. I voiced this to Gabriel, but he smiled and assured me that the kids retain more than they even think they did. And after watching them begin on their own games yesterday, I see that he was right. Fairly complex scripts that have some characters wait while others complete a task, backgrounds that switch or that whip characters through portals are just a few of the things the kids were able to do after very little prompting. I am so impressed at their abilities after just ONE tutorial. The media has also been quite interested in our little class. We have had the visits from both the local newspapers, a tv crew and a radio guy. And I was a bit surprised on the questions they chose to focus on. You could almost say that they were very ‘moral panic’ focused (should talk with Simon about this at some point). In the class you see here, only two girls were signed up. They made a hamster game while one group of boys made a war game. The two other boy groups both made fairly neutral games that involved chases and fantasy beings. Rather than looking at all the games, the hamster and war game were set against each other in a discourse that was both somewhat gendered and with a focus on ‘computer games=violence’. I think it is an unfair association towards the hard work these kids have put into their games. On the whole, the games were very neutral and fun. Yes, there was one slightly violent game, but the actual game turned out to be fairly tame and also provides an opportunity to discuss issues with your student/child about the themes he or she uses in their game. You can check out the media coverage in the following links. They should be active for a month from today. All in all, the class sees to have been a great success. The kids have been enthusiastic, and the games fun. The real measure of success, however, will be if one or two download the program and continue coding at home. If nothing else, I hope that we have shown them a different view of what they can achieve with a little excitement, a lot of curiosity, and a willingness to learn and try new things.